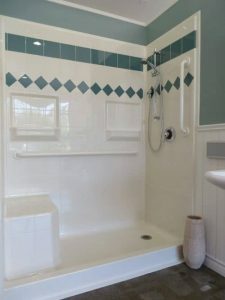 Contractors and architects looking for safe bathing solutions for their home renovations and bathroom remodeling projects come to ORCA HealthCare for barrier free shower solutions, also known as walk-in or roll-in showers. Whether you’re looking for a highly accessible replacement for old, high-threshold bathtubs or a lower cost alternative to expensive walk-in tubs, our barrier free showers are built to maximize long-term value, utility, comfort, and safety. 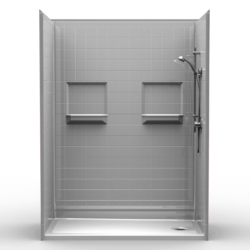 Manufactured with high quality materials and engineered to exact specifications in the USA, installation of a barrier free walk-in shower is fast and easy, saving you time and money while ensuring high quality workmanship and a standard 30-year limited warranty. 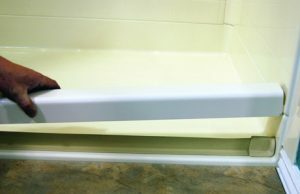 Prefabricated gelcoat fiberglass barrier free showers also eliminate the need for any tile work, mitigating the labor cost in time and expertise for tile installation and maintenance issues that are inherent to bathroom tiles over time. Our barrier free walk-in showers are a perfect solution for bathroom Universal Design – it will meet your changing needs over a lifetime. 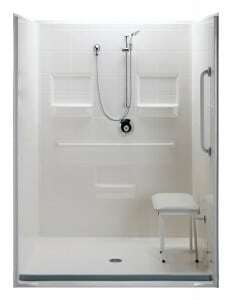 It features a built-in barrier free shower pan designed and engineered for the perfect slope to drain water efficiently. You can also add a semi-permanent threshold that will act as a small curb at 2” in height. This adaptor can be removed should there be a need for a roll-in shower application, particularly useful for tenants of apartment buildings who need a wheelchair accessible bathroom, or if the homeowner is concerned about the resale value of the property. The adaptor is made of high-grade aluminum which is strong enough to secure shower doors, a popular application for many users. If you’re looking for a lifetime shower value for everyone, our barrier free shower solution is the perfect fit for your bathroom remodeling needs. Kris Kassel, New Westminster B.C.